Chocolate - the mere name lightens up most people's faces. Some miss out on eating chocolate cakes because most chocolate cakes have eggs in them. 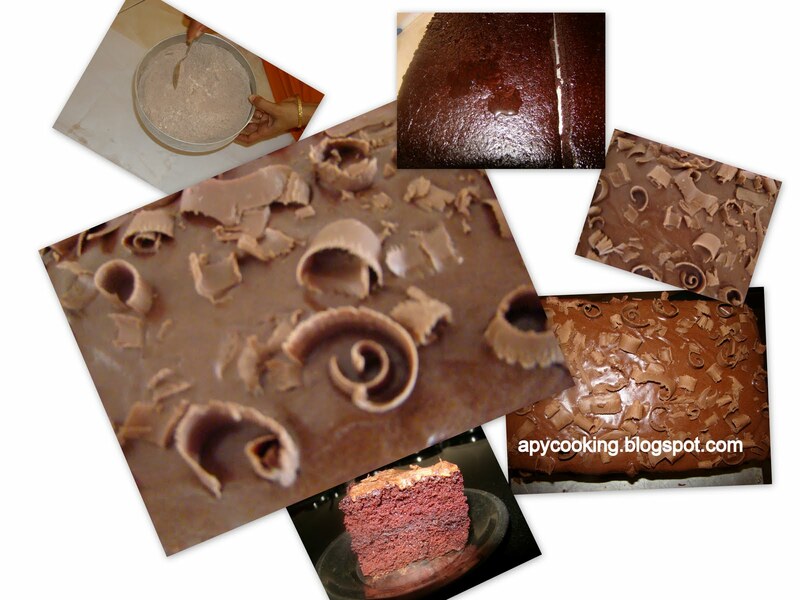 Here's a moist and delightful chocolate cake recipe without eggs which I got from here. Since there is no oven at my disposal right now, I went to my mum's sister's place. It was fun baking the cake with Nandini Pachi. She has baked several delicious cakes, and I got some good tips from her. To frost the cake, I used this recipe. As Hershey's calls it, it definitely is the "Perfectly Chocolate" chocolate frosting. Btw, I have even tried the Hershey's "Perfectly Chocolate" chocolate cake recipe a few months back, so if you want to try a cake with eggs, just go here. NOTE : You can easily halve the recipe if you are looking for an 8" or 9"cake. Blend together the wet ingredients - water, vanilla, vinegar, oil. Add sugar and blend till sugar dissolves. Line a 9" by 13" pan with parchment paper, or grease it well. (I used a 10" by 11"). You can also use two 8" round pans. Bake at 350F (180C) for 40 minutes or until fork inserted comes out clean. 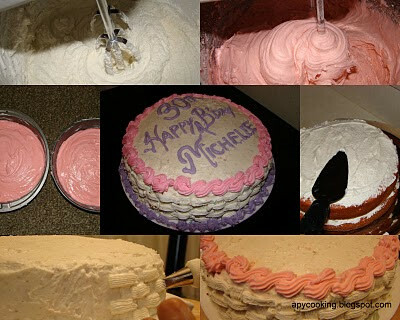 If you plan to frost the cake, cut the cake vertically into half, spread some sugar syrup on the top of one half (spreading sugar syrup is optional. It gives you a softer cake). Spread the frosting on it, place the other half upside down on the first, spread sugar syrup on top and frost the cake all over. And after your are completely done, lick the spatula. It's understandable. [If you are using two 8" round cakes, then spread sugar syrup and frosting on one, place the other cake on top of it and frost all over]. 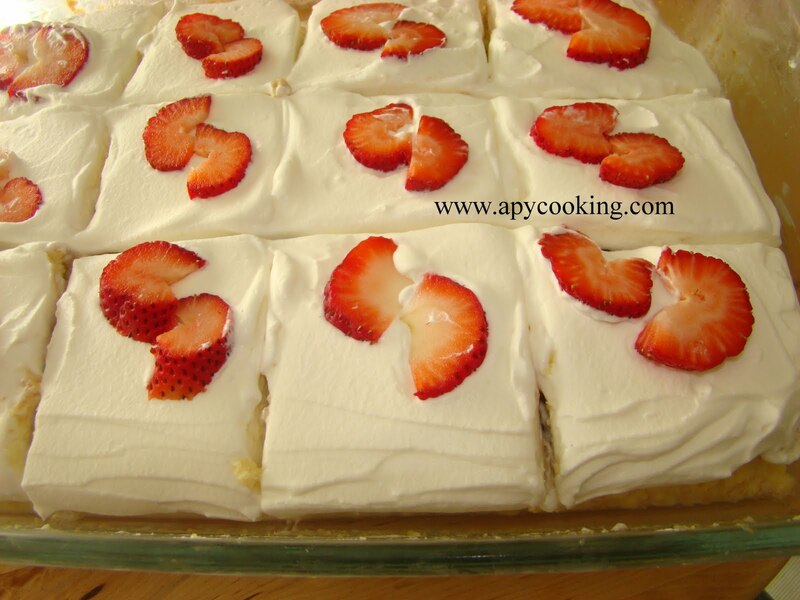 Make sure you don't add too much milk, the frosting will become runny and you will not be able to spread it easily. Take a block of chocolate (I used semi sweet cooking chocolate at room temperature). Place a parchment paper (or any paper for that matter) on the table, under the chocolate. 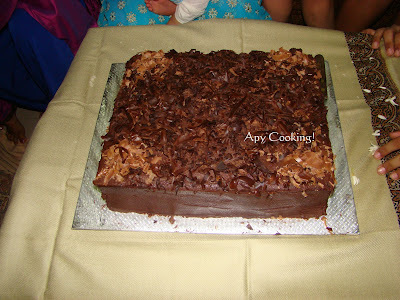 With a peeler, scrape the chocolate, starting from the edges, and let the curls fall on the paper. Update : I baked this cake for my son's birthday party. I made two cakes of two layers each (yes, I made four cakes totally, I was just scared we would run out of cakes!) and made four batches of the same icing. I also used semi-sweet chocolate curls along with milk chocolate curls. Here is the picture of the main cake. The other cake was in the fridge as a standby. Ater baking a few cakes, I thought, why not bake bread?! I turned to aayisrecipes.com and decided to try her Cumin Bread. To 1 cup warm water, add 1 tbsp unsalted butter (room temperature), 1/2 tsp sugar, 2 tsp olive oil and 2 and 1/4 tsp (1 packet) of active dry yeast. Set aside for 10 minutes till yeast turns frothy. Add 1 tsp roasted cumin seeds, 1 tsp salt, 1 and 1/2 cups whole wheat flour, 1 and 1/2 cups all purpose flour. [ The original recipe calls for 2 cups all purpose flour and 1 cup wheat flour]. Knead really well, adding a little water if necessary. Cover and set aside in a vessel greased with oil, for 2 hours. The dough will almost double in size. Using a rolling pin, roll the dough into a rectangular shape. Starting along one side, roll up the dough into a loaf, pinching the seams to hold the loaf together. Roll over so that the seams are at the bottom. Apply olive oil around the loaf, cover and set aside for an hour. The loaf will increase in size. Bake at 500 F for half an hour. Shilpa suggests adding butter after 15 mts and baking for another 15mts. I skipped the butter and the bread did not turn all that brown. But I have no complaints! The bread turned out very tasty. Like Shilpa calls it, 'crusty on the outside, soft on the inside'. Sending the entry to The YeastSpotting event. 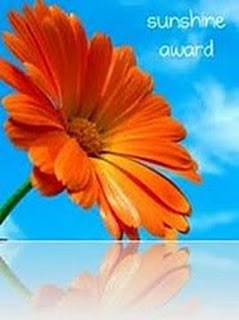 On another note, MD was nice enough to shower the Sunshine Blog award on apycooking. I would like to pass this award to all the new food bloggers, who started their blog in 2010, adding more sunshine to the blogworld! If you are one of them, please accept this award. I am always fascinated by Tarla Dalal not just because she has popularised our Indian Vegetarian cuisine, but for the simplicity and ease which every recipe of hers portrays. She makes one feel that cooking is the most refined and experimental of all forms of art. After trying the recipes from her book ‘Cooking with 1 teaspoon of oil’ which is a collection of low calorie Indian recipes, I confidently could venture into buying ‘ Mexican Cooking ‘ another book of hers which I treasure . Of all the worldwide cuisine, I think Mexican suits our Indian taste buds very comfortably since there is so much similarity of ingredients being used . 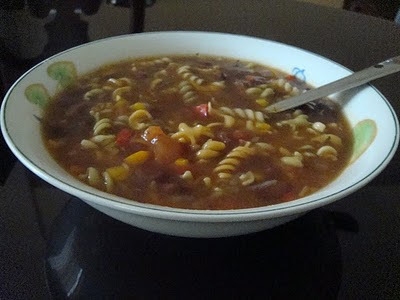 This soup is the output of her recipe with a small change which I made.To make it more filling and a one-pot-meal, I added pasta to it , also red /orange capsicum for crunchiness & green chilli for that extra zing. It was a breezy winter day and one can imagine what magic this hot soup made to our souls . It was a memorable family dinner to cherish! Wash beans and soak overnight. Next day, pressure cook it. Reserve the water in which it is cooked, it gives the silkiness to the soup. In a pan/kadai heat oil and fry onions for a min . Add garlic , green chilli and capsicum and stir fry briefly. Add chilli powder and salt and fry again for 10-15seconds. Add tomatoes and cooked beans along with its liquid and boil on medium flame for 10 to 12 mts or until tomatoes are cooked till mushy. Now add the pasta and lemon juice. Rub the herbs between your palms and add it to the soup. Serve piping hot garnished with the ingredients mentioned . I love the different colours of capsicum. Green, yellow, red, orange - so beautiful, so vibrant! I was in a mood to create something delicious out of the peppers and thought of baking them with some tasty stuffing. Heat oil. Saute finely chopped onion till they turn translucent. Add besan and roast till the raw smell goes off. Add roasted and skinned peanuts. Add finely chopped ginger and garlic (You could substitute with 2 tsp ginger garlic paste). Fry for sometime. Add all the spice powders, finely chopped tomato and roast for a couple of minutes. Add mashed tofu, salt and corriander leaves. Mix well. Remove from flame. Slice the peppers vertically, scoop out the seeds. Drizzle the groove of each half with some oil. Fill and press the stuffing into the grooves so that it goes all the way in. If you want to spice things up, you could sprinkle red chilli flakes on top. Place (stuffed side up) on a greased oven safe pan. (I used greased aluminium foil on the pan). Bake for 35 to 45 mts till peppers become soft. The red and yellow peppers cook faster and get slightly charred - which makes them tastier. My favourite is the red capsicum. I used to think it was the hottest. But it is sweet in taste and when you bite into the stuffed red capsicum, you want to eat yet another! Sending this post to Bake Off and Tasty Tofu Treats. We recently had Keerla Sukke at a friend's place, with Cheppi Kheeri. I loved the combination! Luckily I had some turmeric leaves in the freezer so I decided to make, what else, Keerla Sukke and Cheppi Kheeri! Keerlu is bamboo shoots in konkani language. Cheppi Kheeri is another delicacy made with rice and coconut milk. Konkani food is rich in coconut - grated, dry roasted, coconut milk, paste, and what have you! Traditionally, jaggery is used in the dish which I excluded since my husband and I prefer it this way. I used canned bamboo shoots (Chaokoh) from the Ranch Market. Make sure you wash the bamboo shoots thoroughly. Chop them finely. (And do excuse my picture. I should have chopped better - was running out of time). In a deep bottomed vessel, take some water and boil the bamboo shoots. Meanwhile, heat oil and roast urad dal and corriander seeds. Add red chillies and roast for some more time. Remove from flame and blend with coconut, tamarind and salt, adding water little by little. Don't add too much water - you don't want it to be too watery. Pour the above mixture on the boiling bamboo shoots. Stir for sometime and allow to boil, till all the water is absorbed and the dish appears dry. Season with mustard seeds and curry leaves. And relish with Cheppi Kheeri and pickle :). 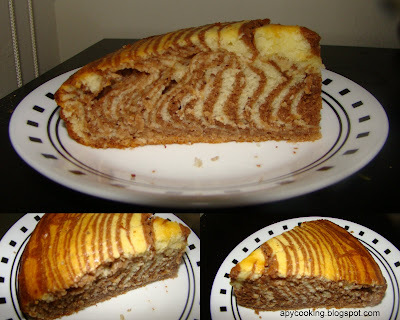 When I first saw the zebra cake I was intrigued. How in the world did they get the dark stripes in between the lighter ones? Google answered my questions, as usual. It took me to Farida's blog where, with great precision, she has given a step by step explanation of how the stripes fall next to each other. Liberally grease a 9" round cake pan. I used cooking spray. In a large bowl, beat 4 eggs one by one. Add sugar and whisk until the mixture is creamy. Add vanilla, oil and milk and continue whisking until well blended. Sift flour (I used maida) and baking powder and combine in a separate bowl. Add the flour mixture to the sugar mixture, little by little and blend as you add. If you add all at once and blend, the flour will fly all over. You don't want the additional work of cleaning the mess! Make sure you scrape the sides of the bowl so that the mixture is evenly blended. Divide the batter equally into two containers. To one, add 2 tbs of *cocoa powder and mix well. Farida cleary mentions that you should avoid using natural unsweetened cocoa - for two reasons, one, it is bitter and two, the stripes will be pale as compared to the darker stripes you'd want. I used Ghiradelli Sweet Ground Chocolate and Cocoa. Next time I will probably try some other dutch processed cocoa powder to get a deeper shade. Btw, I tasted both the unsweetend cocoa and the sweetened, and the unsweetened is definitely bitter, so the sweetened is surely better :). I was holding the camera with my left hand and pouring the batter with my right, so as I was pouring I had to make sure the camera was focussing well. And I took a lot of pictures. So that was quite an adventure! Next time, the cameras will be off. I definitely want to do a better job with the stripes! Now very carefully place the pan into the oven. Make sure you don't tilt it as you place it. Bake for 40 to 45 mts, or until a fork inserted comes out clean. I did not want to top it with any icing, since the stripes themselves are a treat to the eyes. Since this is eaten straight out of the oven, I'm sending this post to the Bake -Off event organised my Champa.